Evidence from the Challenger Deep– the deepest surveyed point in the world's oceans– suggests that tiny single-celled creatures called foraminifera living at extreme depths of more than ten kilometres build their homes using material that sinks down from near the ocean surface. The Challenger Deep is located in the Mariana Trench in the western Pacific Ocean. It lies in the hadal zone beyond the abyssal zone, and plunges down to a water depth of around 11 kilometres. "The hadal zone extends from around six kilometres to the deepest seafloor. Although the deepest parts of the deepest trenches are pretty inhospitable environments, at least for some types of organism, certain kinds of foraminifera are common in the bottom sediments," said Professor Andrew Gooday of the National Oceanography Centre, Southampton (NOCS) and member of a UK-Japanese team studying these organisms in samples collected in 2002 during a Japan-USA-Korea expedition to study life in the western depression of the Challenger Deep. The researchers, whose findings appear in the latest issue of the journal Deep Sea Research, used the remotely operated vehicle KAIKO, operated by the Japan Agency for Marine-Earth Science and Technology (JAMSTEC), to take core samples from the soft sediment of the trench floor. 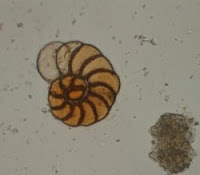 Among many foraminiferans with an organic shell (or 'test'), they found four undescribed specimens with agglutinated tests. "The Challenger Deep is an extreme environment for agglutinated foraminifera, which construct their tests from a wide range of particles cemented together by calcareous or organic matter," said Gooday. "At these great depths, particles made from biologically formed calcite and silica, as well as minerals such as quartz, should dissolve, leaving only clay grains available for test building." The researchers were therefore surprised to discover that foraminiferan tests sampled from the Challenger Deep contained calcareous components, including the dissolved remnants of coccoliths, the calcium carbonate plates of tiny algae called coccolithophores, and planktonic foraminiferan test fragments. The organic test surface of one species was densely pitted with imprints, which the researchers interpreted as representing mineral grains of various types, including quartz, which subsequently dissolved. Agglutinated particles, presumed to be clay minerals, survived only in one specimen. "Our observations demonstrate that coccoliths, and probably also planktonic foraminiferan tests, reach the Challenger Deep intact," said Gooday. "These particles were probably transported to these extreme depths in rapidly sinking marine snow, the aggregated remains of phytoplankton that lived in the sunlit surface ocean, or in faecal pellets from zooplankton." It seems likely, therefore, that at least some agglutinated foraminifera living at extreme hadal depths build their homes from material that sinks down from the ocean above, rather like manna from heaven.